MySQL and PostgreSQL are the #1 and #2 open source databases, respectively, providing complementary features to meet the requirements of any open source database developer. The latest Toad Edge (2.02) is an all-in-one, integrated development environment (IDE) for MySQL and PostgreSQL databases, including support for the MySQL- and PostgreSQL-compatible Aurora, and the MySQL-compatible MariaDB. Additionally, Toad Edge 2.02 supports the enterprise class EnterpriseDB (EDB) Postgres. Toad Edge features include database object management, content assist in SQL Worksheet, schema compare, import of data from various formats including SQL & CSV, export of result set records, and database snapshots; to mention a few. Toad Edge 2.02 is a one-stop solution for any open source database developer. Toad Edge also supports Amazon Redshift in Beta. In this article we shall discuss using Toad Edge with MySQL, PostgreSQL, Aurora, and MariaDB on AWS RDS. We shall also discuss using EDB Postgres. This article has the following sections. 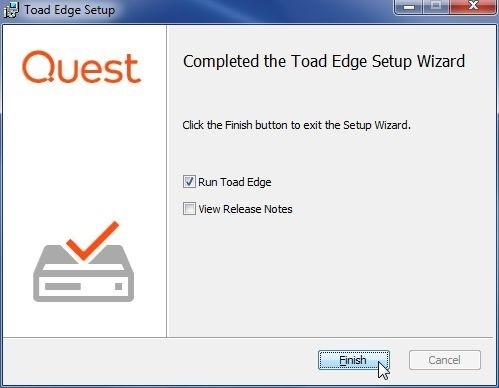 Download the Toad Edge 2.0.2 trial edition, which isa full-featured, fully functioning version. 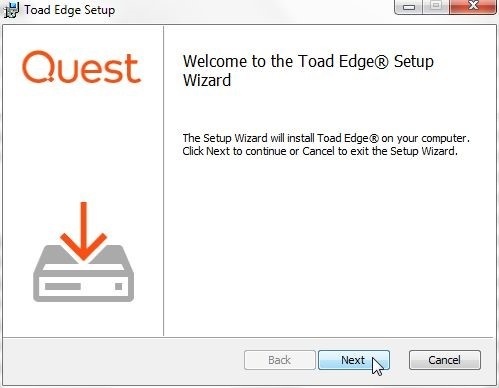 Double-click on the toadedge_2.0.2_x64_en.exe application to launch the Toad Edge Setup wizard, which is shown in Figure 1. Click on Next. Accept the End-User Agreement and click on Next. Keep the default destination folder and click on Next as shown in Figure 2. 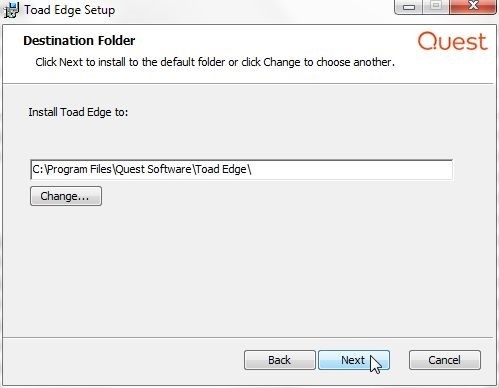 Click on Install in Ready to Install Toad Edge 2.0.2. Toad Edge gets installed and registered. When installation completes click on Finish as shown in Figure 3. 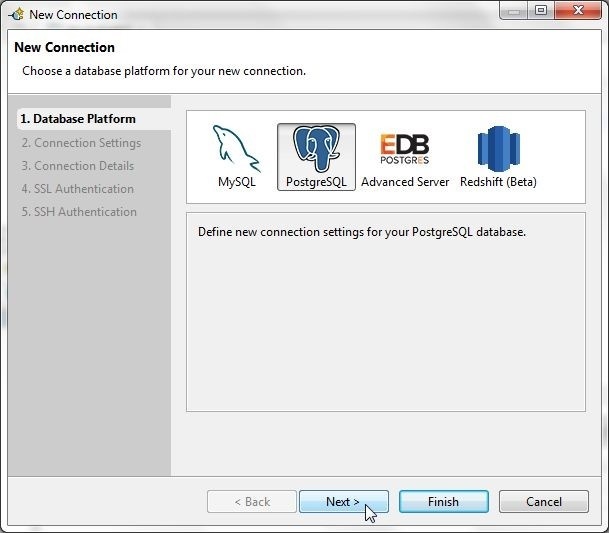 If the Toad Edge for MySQL and Toad Edge Preview for PostgreSQL were previously installed, the license gets updated, as indicated in Figure 4. The only other requirement is an AWS account, which may be created at https://aws.amazon.com/resources/create-account/ . Toad Edge 2.0.2 supports MySQL 5.5, 5.6, 5.7. The MySQL database could be on a local machine or on a cloud service. We shall be using the AWS Relational Database Service (RDS). Log-in to AWS and select the RDS service. Click on Get started now in the RDS introduction screen. Select database engine as MySQL as shown in Figure 5. RDS supports a MySQL database size up to 16 TB. Instances offer up to 32 vCPUs and 244 GiB memory. RDS supports automatic backup and point-in-time recovery. Cross-region read replicas are supported. Click on Next. Choose the use case as Dev/Test – MySQL and click on Next as shown in Figure 6. Specify DB details, which include instance specification and settings. The DB engine is pre-selected as MySQL Community Edition. Select License as general-public-license. Select DB engine version as mysql 5.7.21 as shown in Figure 7. Select the option to enable only Free tier eligible options as shown in Figure 8. 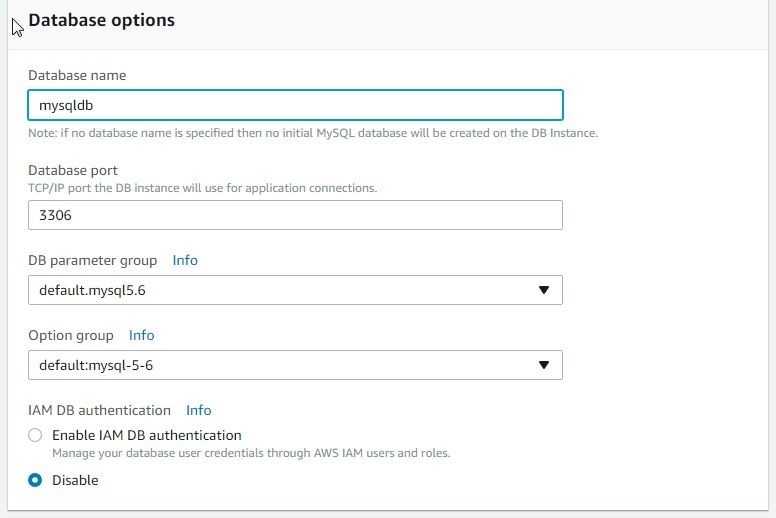 In Settings specify a DB instance identifier (mysqldb) as shown in Figure 9. Specify Master username and Master password. Click on Next. In Configure advanced settings select Publicly accessible as Yes. In Database options specify a Database name (mysqldb) as shown in Figure 10. Specify Database port as 3306. Keep other settings as the default. Scroll down and keep the default settings for Encryption, Backup, and Monitoring. 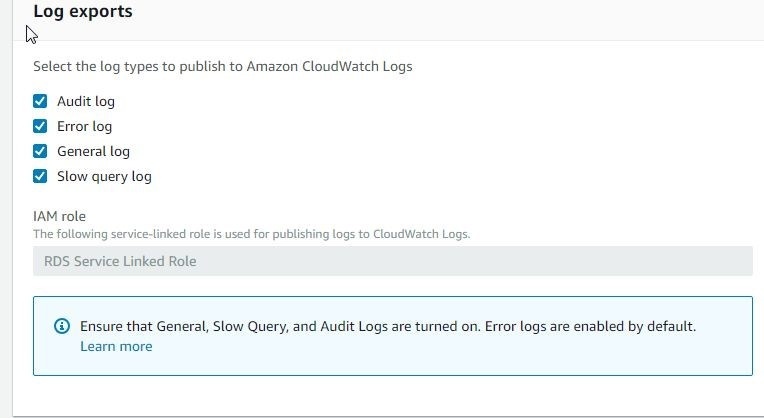 For Log exports to CloudWatch Logs select the Audit log, Error log, General log, and Slow query log as shown in Figure 11. Keeping the default configuration for Maintenance, click on Launch DB instance. The DB instance starts to get created. Click on View DB Instance details, which should display a Summary of the new MySQL instance being created. The Instances lists the new MySQL RDS instance with Status as available after a few minutes, as shown in Figure 12. Click on the mysqldb link to get instance details. The mysqldb summary screen includes a Connect section, which includes Endpoint and Port, as shown in Figure 13. Copy the Endpoint value as it is the host name for the database. In the Security group page select the Inbound tab and click on Edit as shown in Figure 15. In Edit inbound rules modify Type to All Traffic, and Source to Anywhere to allow all TCP traffc as shown in Figure 16. Click on Save. The Inbound rules get modified, as shown in Figure 17. The Inbound rules also get modified on the Summary page, as shown in Figure 18. If the DB name and username are not kept note of when being configured, these may be obtained from the Details>Configuration section, as shown in Figure 19. Next, we shall connect with a MySQL based RDS instance in Toad Edge. Select Connect>New Connection as shown in Figure 20. 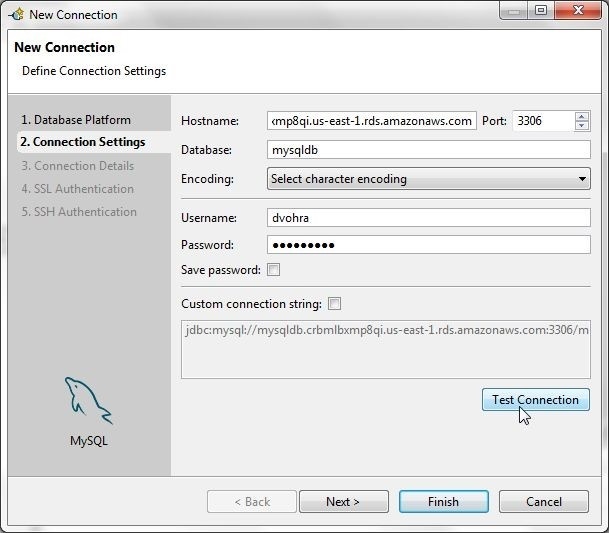 In the New Connection wizard select Database Platform as MySQL as shown in Figure 21 and click on Next. In Connection Settings specify Hostname as the Endpoint for the RDS instance copied earlier. Specify Database as mysqldb. Specify Username and Password and click on Test Connection as shown in Figure 22. If the message Connection is OK gets displayed click on Next as shown in Figure 23. 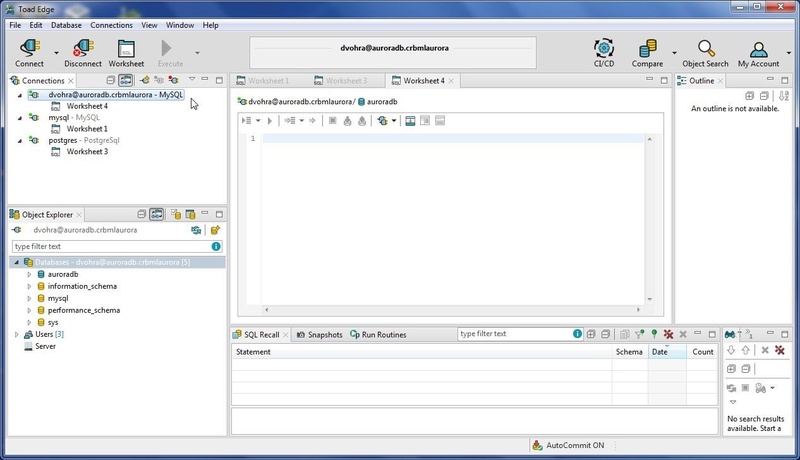 In Connection Details select the option to Enable Autocommit as shown in Figure 24. Modify the default Connection name, which includes the host name, to a shorter name (mysql) as shown in Figure 25. The option to use SSL/SSH Authentication is also provided. Click on Finish. A new connection gets added in Connections view, as shown in Figure 26. The default (active) database is indicated in Object Explorer with a bluish-green color. AutoCommit ON label indicates that the auto-commit is on. Toad Edge 2.0.2 supports PostgreSQL 9.5, 9.6, 10. We shall be using version 9.6 on AWS RDS. To create an RDS instance for PostgreSQL click on Launch DB Instance in RDS Console as shown in Figure 27. In the Launch DB Instance wizard, first select engine as PostgreSQL, as shown in Figure 28. Click on Next. 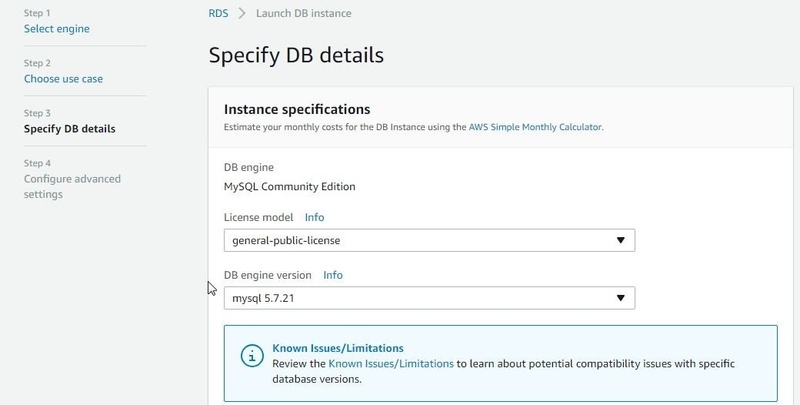 Specify DB details, which include selecting a License model, DB engine version, DB instance class, Multi-AZ deployment, Storage Type, and Allocated Storage. In Settings specify a DB instance identifier (postgresdb), and specify a Master username and password. Click on Next. In Configure advanced settings select a VPC and Subnet group. Select Yes for Publicly accessibility. Click on Launch DB Instance to launch the RDS instance for PostgreSQL. The RDS instance postgresdb gets created, as shown in Figure 29. Click on the postgresdb link to display Summary. From the Connect section copy the Endpoint as shown in Figure 30. The Port is 5432. Modify the Security group for Inbound rules to allow all traffic, as explained for the MySQ based RDS instance. The DB Name and Username may be obtained from the Details>Configuration section, as shown in Figure 31. The password is not displayed and must be made note of when creating the RDS instance. 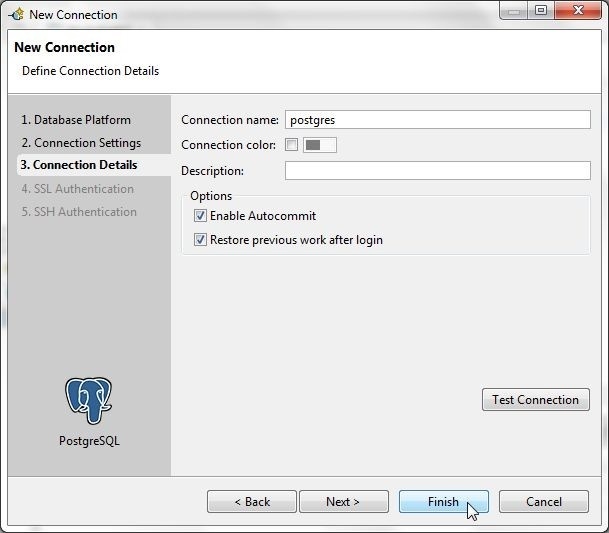 To connect with the PostgreSQL based RDS instance, select Connect>New Connection as shown above in Figure 20. Alternatively, select New Connection in Connections view as shown in Figure 32. 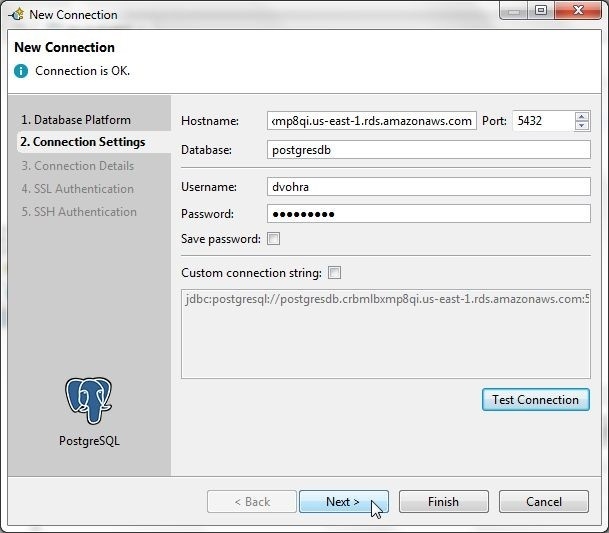 In the New Connection wizard select database engine as PostgreSQL, as shown in Figure 33, and click on Next. In the Connection Settings specify Hostname as the Endpoint for the RDS instance as shown in Figure 34. Specify the Database as the DB Name postgresdb. Specify Username as the Master Username and Password as the Master Password. Click on Test Connection. If the message Connection is OK is displayed, as shown in Figure 35, click on Next. 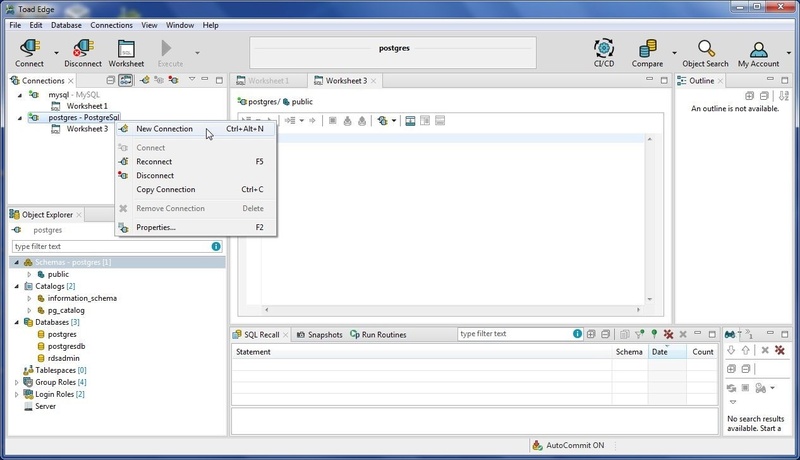 In Connection Details select the option to Enable Autocommit and shorten the Connection name (postgres), as shown in Figure 36, and click on Finish. 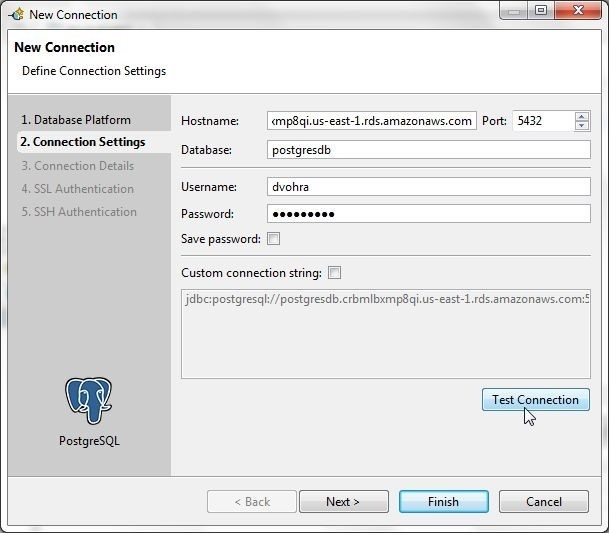 A new connection gets added for PostgreSQL, as shown in Figure 37. Toad Edge 2.0.2 supports EDB Postgres Advanced Server 9.6, and 10 and we shall be using EDB Postgres Advanced Server 9.6,10. An account registration with Enterprisedb.com is required. Download EDB Postgres Advanced Server v10.0 for Windows x86-64 Interactive Installer (edb-as10-server-10.1.5-2-windows-x64.zip file). Extract the edb-as10-server-10.1.5-2-windows-x64.zip file to a directory. Right-click on the edb-as10-server-10.1.5-2-windows-x64.exe application and select Run as administrator. The EDB Postgres Advanced Server Setup wizard gets started. Click on Next. Accept the license agreement and click on Next. 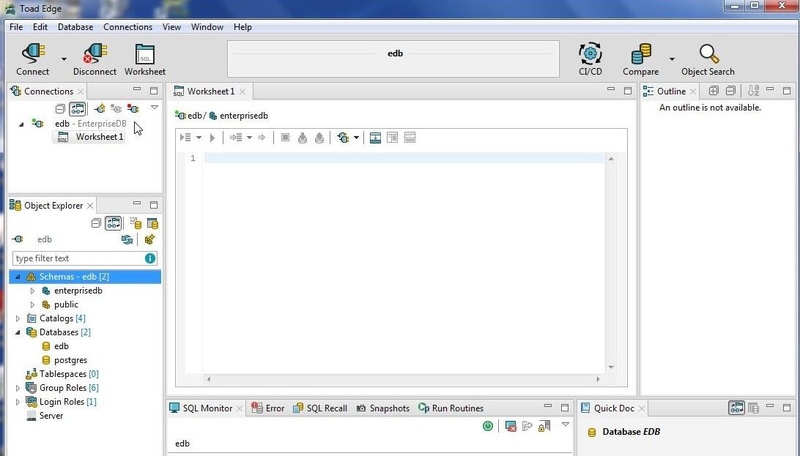 Provide the user credentials as registered in an account with EnterpriseDB. Click on Next. Select the default Installation Directory and click on Next. Select the default components to install and click on Next. Select the default Additional Directories, which include the Data directory and the WAL directory and click on Next. 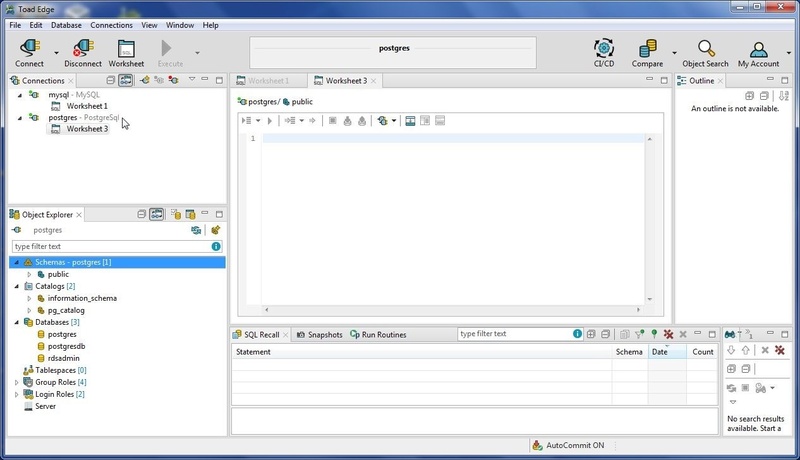 Select the Advanced Server Dialect from two choices of Compatible with Oracle and Compatible with PostgreSQL and click on Next. By selecting a compatible database, Advanced Server configures data type conversions, time and date formats, and dictionary views such that it is easier to migrate or develop new applications that are compatible with the database selected. Specify a password for the superuser enterprisedb and click on Next. Select the default port setting of 5444 and default locale. Select server type as Development and click on Next. Select workload type as Transaction processing and click on Next. In Update Notification Service select the default option to install updates when available and click on Next. The Pre-Installation Summary lists the settings for the installation. Click on Next. In Ready to Install click on Next to start the installation. The database server startup gets configured and started. When the installation has completed click on Finish. While the JDBC drivers for MySQL and PostgreSQL databases are packaged with Toad Edge, the JDBC drivers for EDB are not. 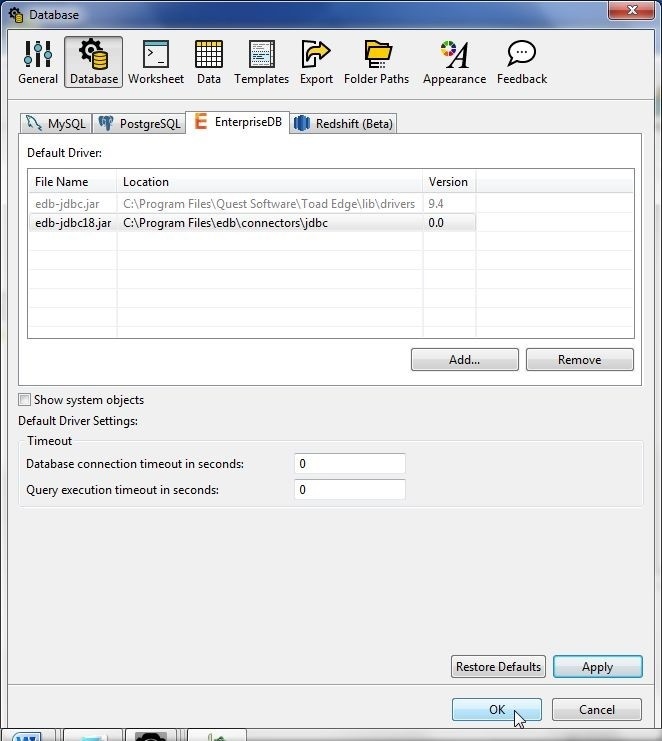 Download EDB Connectors 10.0.1 (JDBC, ODBC, OCI, .NET) for Windows x86-64 (edb-connectors-10.0.1-1-windows-x64.exe application) from ADD-ON COMPONENTS & BUNDLES. Right-click on the edb-connectors-10.0.1-1-windows-x64.exe application and select Run as administrator. Select installation language as English. 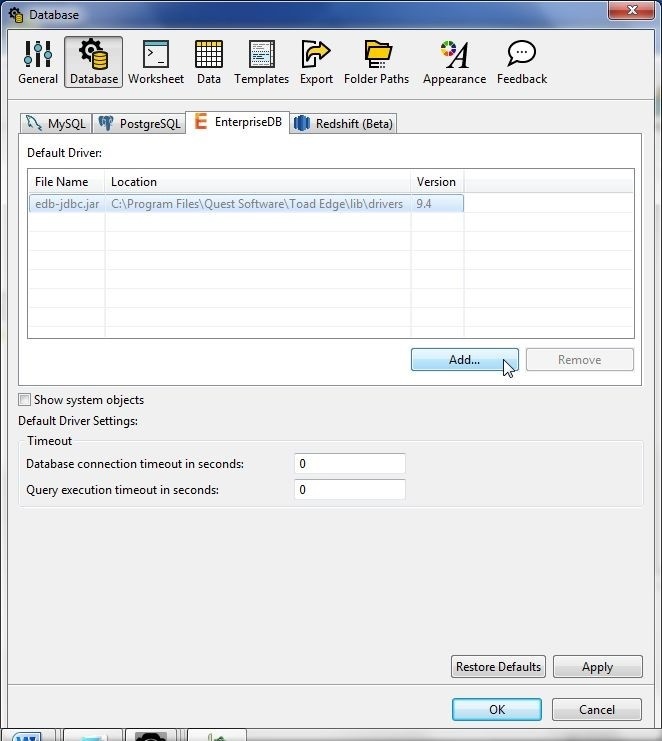 Follow through with the Setup wizard using default settings to install the EDB connectors. Next, configure the EDB Connectors in Toad Edge. Select View>Preferences as shown in Figure 38. 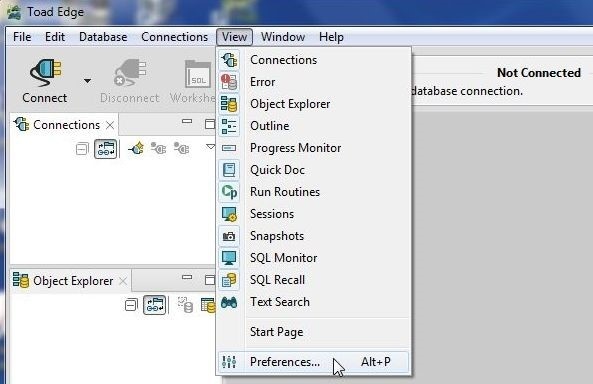 In Preferences select Database and select the EnterpriseDB tab as shown in Figure 39. Click on Add... to add a JDBC driver. Add the edb-jdbc18.jar as shown in Figure 40. Click on Apply. Click on OK.
To connect with EDB in Toad Edge select Connect>New Connection. 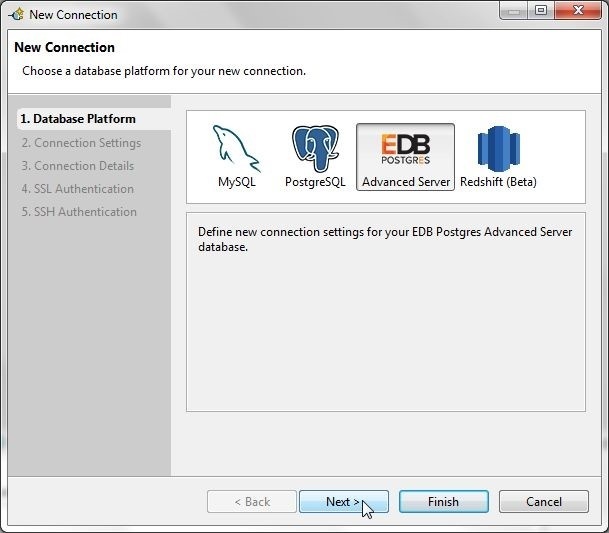 In the New Connection wizard select database as EDB Postgres Advanced Server and click on Next as shown in Figure 41. 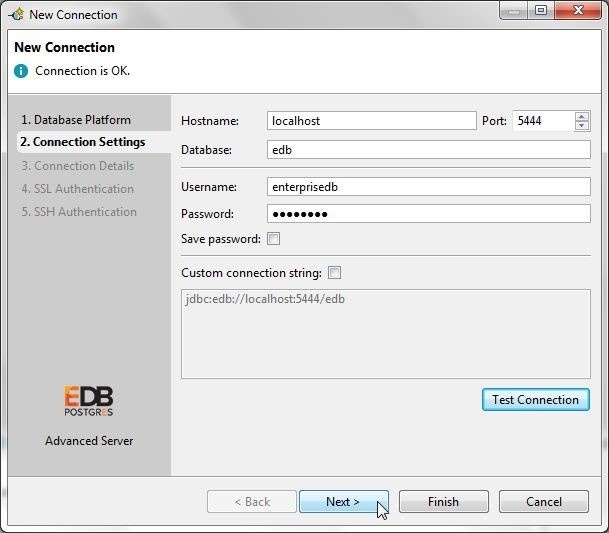 In Connection Settings specify Hostname as localhost, Database as edb, Username as enterprisedb and the Password as configured when installing EDB. Click on Test Connection and if the message Connection is OK is output, as shown in Figure 42, click on Next. 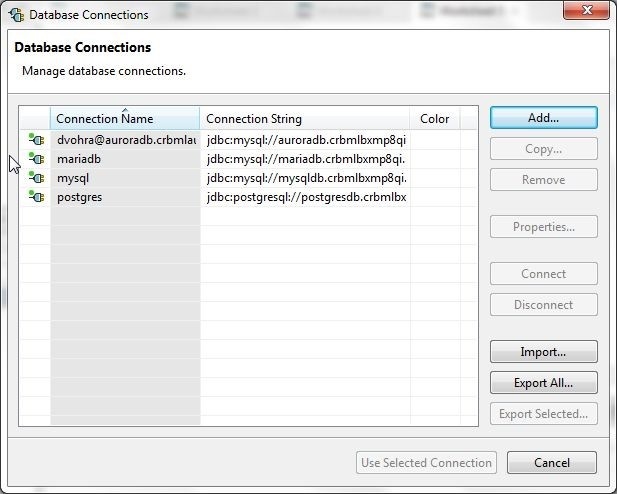 In Connection Details shorten the Connection name (edb) and select the option to Enable Autocommit as shown in Figure 43. Click on Finish. A connection to EDB gets added, as shown in Figure 44. The enterprisedb is listed as the default (active) schema in Object Explorer. 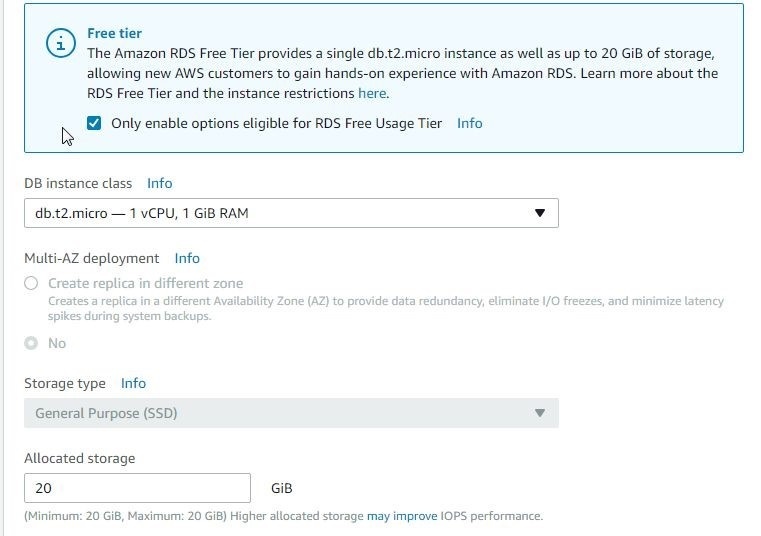 Amazon Aurora is a MySQL- and PostgreSQL-compatible database available only on AWS RDS. To create an Aurora instance click on Launch DB Instance in RDS Console. 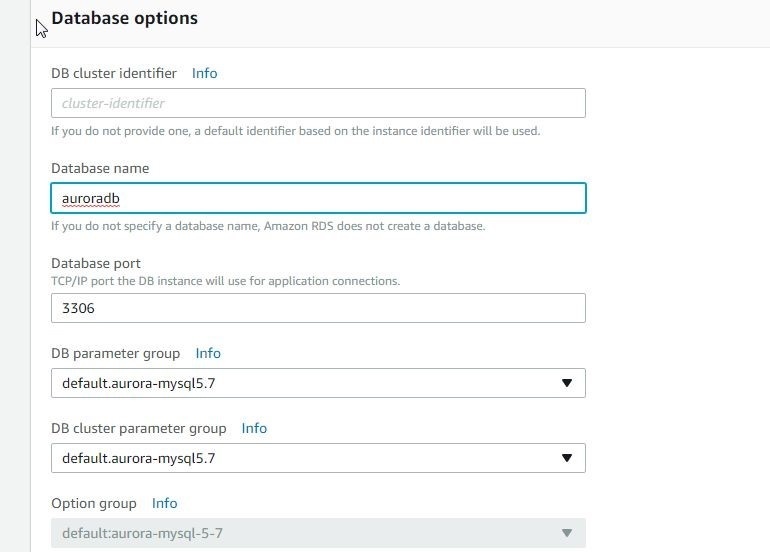 Select database engine as Amazon Aurora as shown in Figure 45. Select Edition as MySQL 5.7-compatible and click on Next as shown in Figure 46. Next, specify DB details including DB instance class. For Multi-AZ deployment select Create Replica in Different Zone. 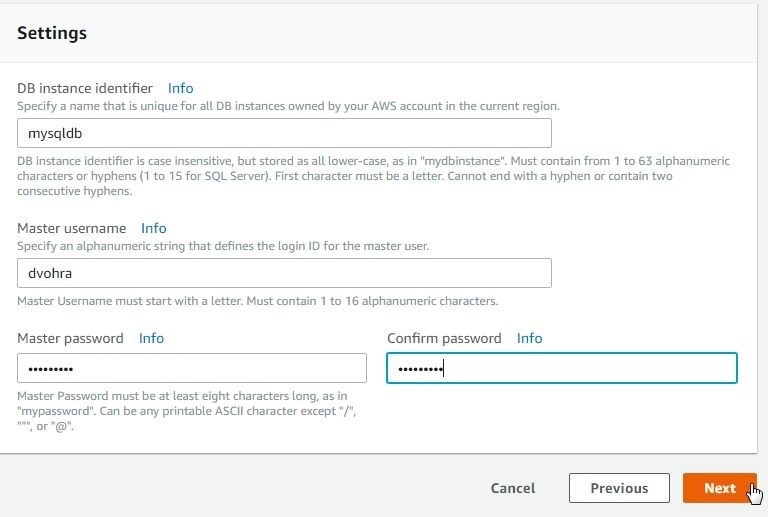 In Settings specify DB instance identifier (auroradb), Master username and Master password. Click on Next. In Configure advanced settings select a VPC and a Subnet group. Public accessibility must be set to Yes. For Availability zone select No preference. Select the option to Create new VPC security group. In Database options specify a Database name (auroradb) as shown in Figure 47. The DB cluster identifier field may be kept blank as a default cluster identifier derived from instance identifier gets generated. Database port is 3306 by default. Keep Encryption, Failover, Backup, Monitoring and Maintenance settings as default. Select the log types to export to CloudWatch Logs and click on Launch DB Instance. Two DB instances get created, one for the Aurora database and another for the Aurora DB Cluster, as shown in Figure 48. Click on the link for auroradb get instance details including the Endpoint and Port as shown in Figure 49. 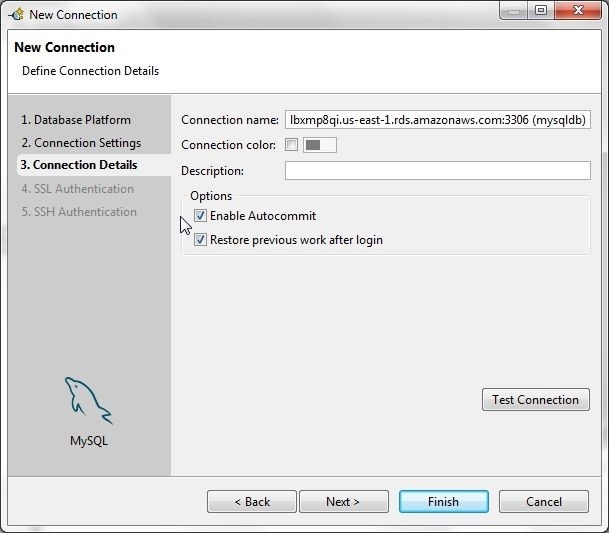 Modify the Inbound access rules to allow all traffic on all ports from all sources as explained for MySQL and PostgreSQL and shown in Figure 50. The DB Name and Username may be obtained from Details>Configuration, as shown in Figure 51. To create a connection with Aurora select Connect>New Connection. 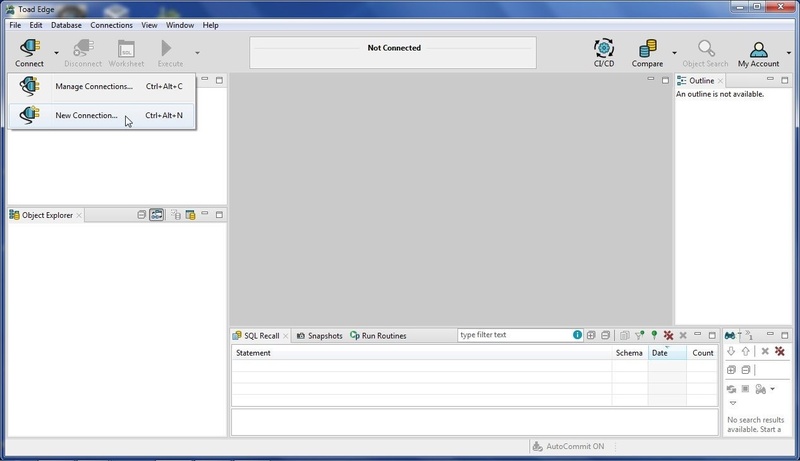 Alternatively, right-click on a connection in Connections view and select New Connection as shown in Figure 52. In New Connection select MySQL database platform and click on Next as shown in Figure 53. In New Connection wizard, first specify Hostname as the Endpoint for Aurora DB instance. Specify Port as 3306 and Database as auroradb. Specify Username and Password and click on Test Connection. If the message :Connection is OK” is displayed, as shown in Figure 54, click on Next. In Connection Details optionally specify a shorter name (aurora) for the connection and select the option to Enable Autocommit as shown in Figure 55. A new connection for Aurora gets added, as shown in Figure 56. The Object Explorer lists the user-created database auroradb as the default (active) database. MariaDB is a MySQL-compatible database developed by the original developers of the MariaDB 10.1, 10.2 database. Toad Edge 2.0.2 supports MariaDB 10.1, 10.2. 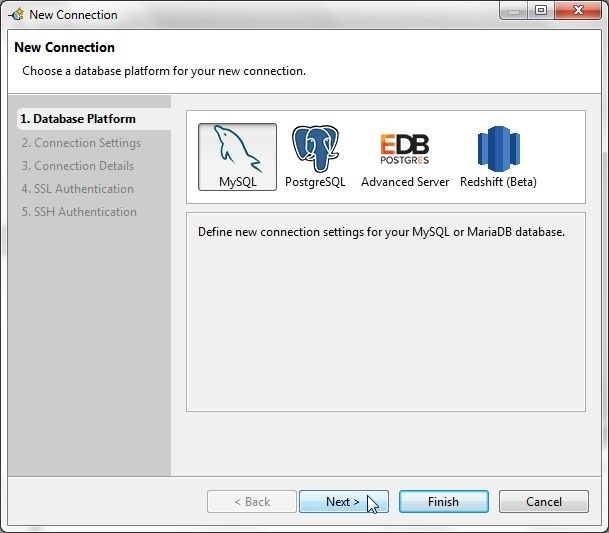 To create a MariaDB instance click on Launch DB Instance in RDS Console. Select database engine as MariaDB as shown in Figure 57. Click on Next. In Choose use case select Dev/Test – MariaDB and click on Next. Specify DB Details including the License model, DB engine version and the option to Only enable options eligible for RDS Free Usage Tier. Select a DB instance class, Storage type and Allocated storage. In Settings specify a DB instance identifier (mariadb), Master username, and Master password and click on Next. In Configure advanced settings select a VPC, Subnet group, and set Public accessibility to Yes. Set Availability zone to No preference and select the option to Create new VPC security group. In Database options specify a Database name (mariadb) and keep the default setting for Port as 3306. Configure Monitoring and select the log types to export to CloudWatch Logs. Keeping the default settings for Maintenance click on Launch DB Instance. 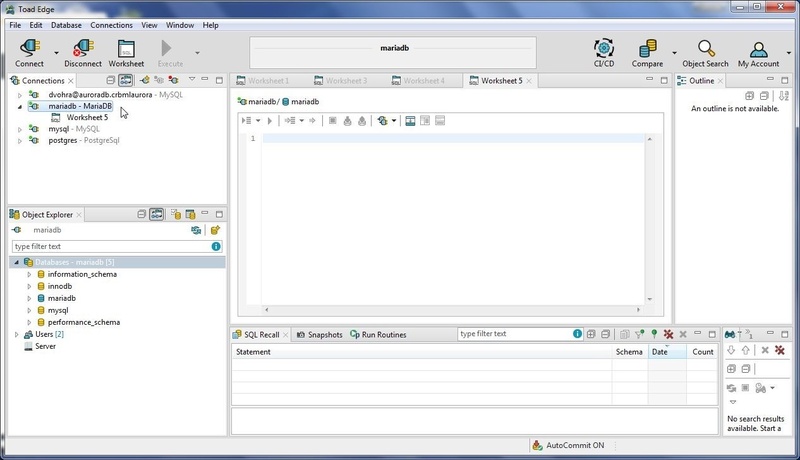 An RDS instance for MariaDB gets created, as shown in Figure 58. Click on the mariadb link to display Summary. From the Connect section obtain the Endpoint as shown in Figure 59. Modify the Security group Inbound rules to allow all traffic on all ports from all sources as shown in Figure 60. The DB Name and Username may be obtained from Details>Configuration. We have discussed the different options to launch the New Connection wizard. One other option is to select Connections>Manage Connections as shown in Figure 61. 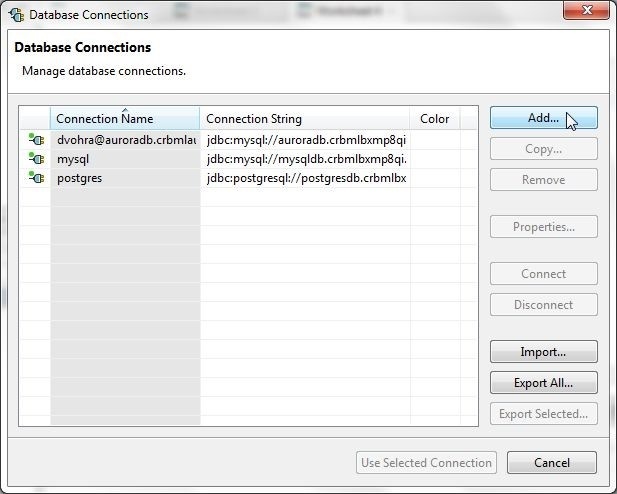 In Database Connections click on Add… to add a new connection as shown in Figure 62. 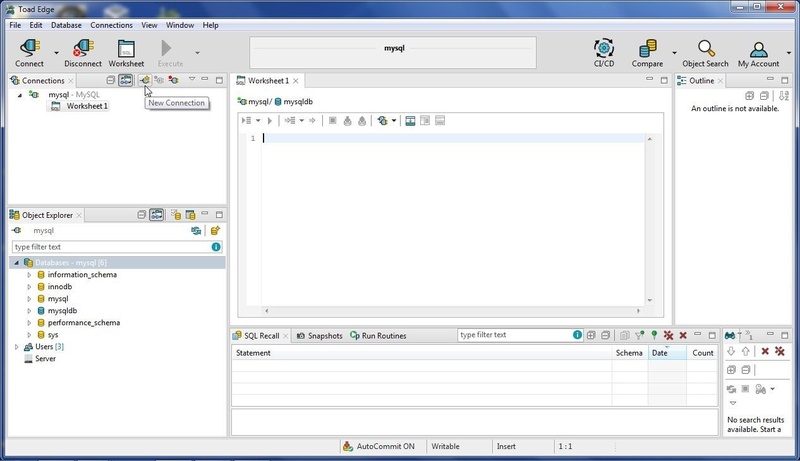 The New Connection wizard gets launched; in which, select MySQL as the Database Platform and click on Next as shown in Figure 63. In the Connection Settings specify Hostname as the Endpoint for the mariadb instance on RDS. Specify Port as 3306. Specify Username and Password and click on Test Connection. If the message Connection is OK is output, as shown in Figure 64, click on Next. In Connection Details optionally specify a shorter Connection name (mariadb) than the default and select the option Enable Autocommit as shown in Figure 65. Click on Finish. A new connection gets added to Database Connections, as shown in Figure 66. A new connection also gets added to Connections view, as shown in Figure 67. The default (active) database in Object Explorer is set to mariadb, the user created database. In this article we discussed the new Toad Edge 2.0.2 as an all-in-one IDE for open source database development with MySQL, PostgreSQL, EDB, Aurora, and MariaDB.